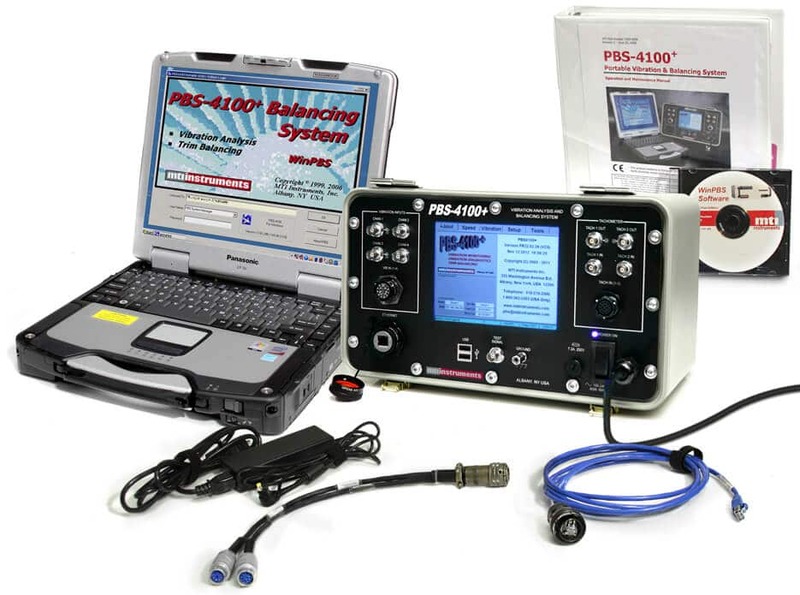 Portable vibration analysis and engine trim balance instruments and accessories for commercial and military aviation. Designed to swiftly pinpoint engine problems and eliminate avoidable engine removals. Rapid configuration and intuitive user interface make it straightforward and uncomplicated to use. The strategy of the PBS-4100+ is to correlate vibration magnitude to the specific moving parts within an engine. This way, different vibration content is “matched-up” with each of their respective spools. The overall engine vibration may be considered as the summation of the vibration contributions by each moving part within the engine. It becomes critical to correlate a given rotation with each of the respective moving parts within the engine, as the source of the vibration can then be ascertained and corrected. The PBS-4100+ employs a series of on-board digitizers to measure the magnitude of the vibration and each spools’ rotational speed. Advanced logic is integrated to assess the 12-o’clock position of each engine spool to understand where on the spool an imbalance might be located. Vibration is correlated to the spools using a series of configurable “tracking filters”. A “tracking filter” is a series of specialized computer algorithms, which measure the rotational speed of a given spool, then filter the vibration content outside of a narrow band of interest. The narrow band of interest is the characteristic frequency of vibration around each spool’s rotational speed. Using the tracking filter for each speed, the contribution of vibration of each spool is separated. As vibration varies with engine speed, measurements are “trended”. In testing an engine, the operator will execute a vibration survey on the turbine engine. The survey is a slow cycling of engine speed from idle to maximum, then back down to idle again. As this occurs, the PBS-4100+ will measure the vibration contribution from each of the spools and plot its findings on a series of plots (most notably, a “Speed versus Vibration” plot. In addition, the overall vibration is also plotted.